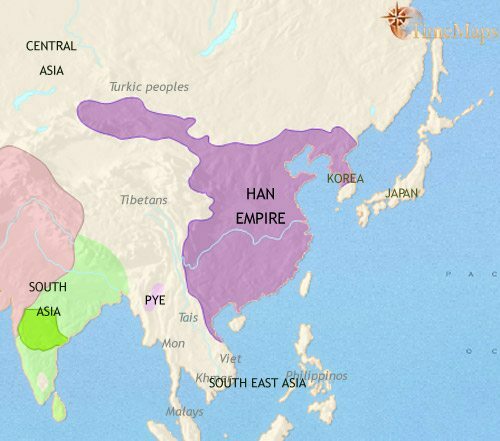 The Han dynasty of China has dominated much of ancient East Asia for a long period of history - but not for much longer. By this stage in history, farming is well-established in the two great river valleys of ancient China, and is spreading to neighbouring lands. Agriculture is spreading out from its core areas in ancient China, and one of the greatest civilizations in world history is emerging. The first urban civilization has appeared in the ancient history of East Asia, under the Shang dynasty in China. Ancient Chinese civilization expands under the Zhou dynasty, which will be the longest-lasting dynasty in China's history. The philosopher Confucius, whose teachings will influence millions of people down to the present day, lives at this time. Under the Han dynasty, ancient Chinese civilization has expanded both its territory and its influence. 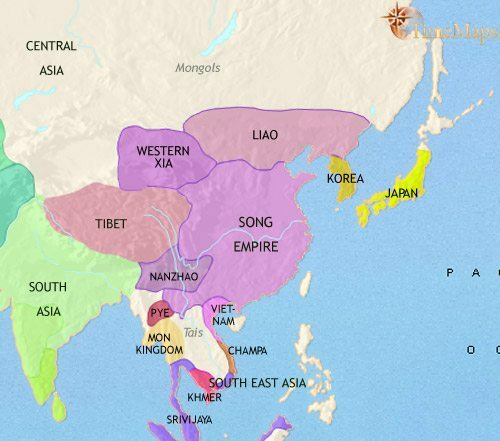 At this phase in its history China is weak and divided, but its influence continues to spread through ancient East Asia, in Korea, Japan and Vietnam. China is now united and powerful under the great Tang dynasty, one of the most glorious in its history, and exerts a huge influence on Japan and Korea. China's influence over Korea and Japan has diminished, but at home this phase of its history is a time of great advance. In this period of East Asia's history great technological advances occur, both in China and Korea. 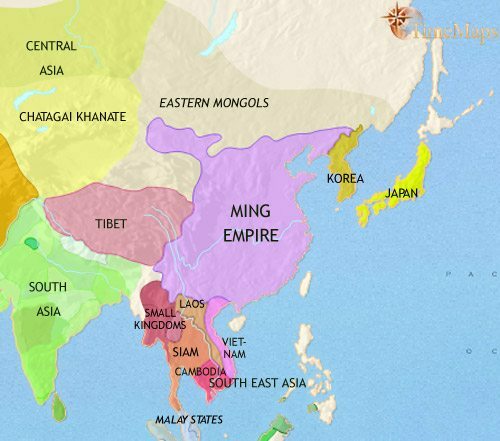 The history of the region has been dominated by the rise and fall of the Mongol empire, but Ming dynasty China is now at the centre of a tributary system spanning East Asia. In China, the Qing dynasty rules, and Japan and Korea have experienced one of the most destructive wars in East Asian history. 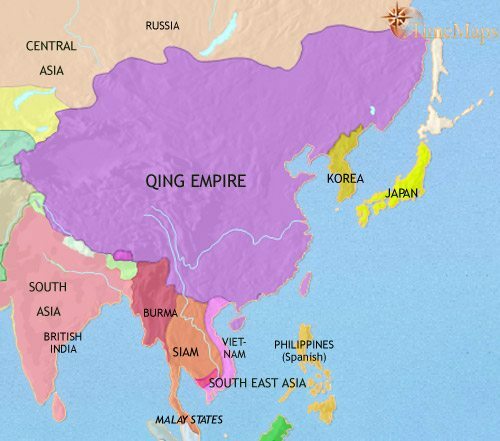 This is the last glorious phase of East Asia's history before it feels the West's impact, and Qing dynasty China dominates the region with its tributary system. New intrusions into East Asian history, Western merchants and missionaries, are clamouring to be let into China and the other countries of East Asia. East Asian history has taken a radically new direction as Western powers force open the doors of China and Jappan to trade and missionary activity. Japan has successfully modernized, and has gained international status at the expense of China and Korea. China, Japan and Korea have all experienced some of the most turbulent times in their entire history, as great wars have swept through East Asia. The recent histories of all the nations of East Asia, China, Japan and Korea, have seen them become major economic powerhouses in the world. The Han dynasty has now governed China for 400 years. It will not do so for much longer. Forces are at work which are tearing its empire apart and will lead to the next phase of Ancient China’s history – one of weakness and division. The late Han period in China sees an important advance in technology, with the invention of paper. This apparently took place at the imperial court itself, in an effort to make administration more manageable. China’s long-lasting influence upon the East Asian world continues to grow, however. In Korea, the Chinese occupation has led to the growth of the powerful kingdom of Koguryo; here and elsewhere in the Korean peninsula the tribal aristocracies are adopting many elements of Chinese civilization. Furthermore, links between the Korean peninsula and Japan remain very strong, and these act as a conduit for Chinese influences into these islands. By this date, Buddhism has begun to reach East Asia, with missionaries arriving from Central Asia. 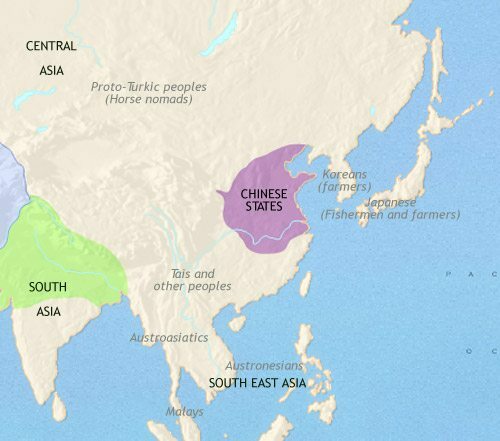 Stone-Age farming cultures had emerged in the two great river valleys of China by around 6000 BCE. On the Yellow River plains of northern China millet was the main crop, whilst in the Yangze Valley to the south wet-rice cultivation predominated. 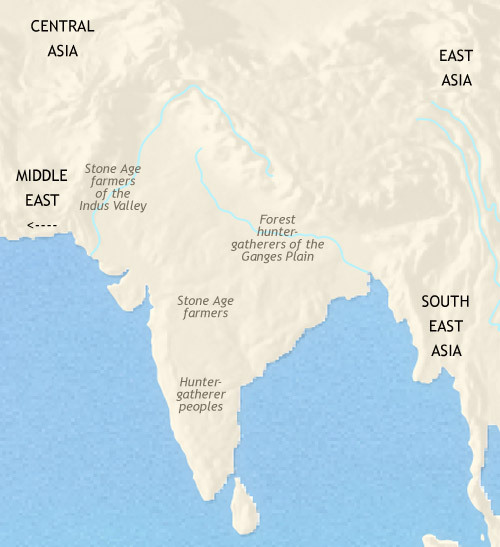 By this stage in history (3500 BCE) both regions were home to well-established farming communities. 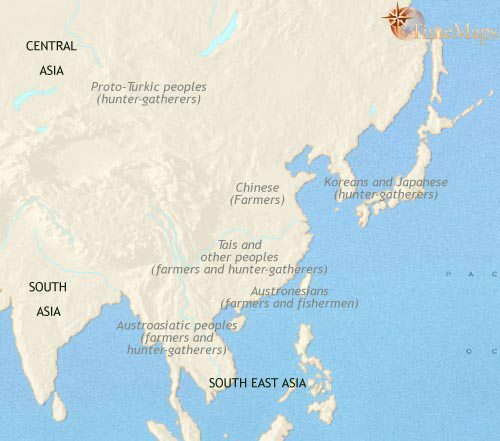 Agriculture was beginning to spread to neighbouring regions of ancient East Asia. Millet farming had recently arrived in the Korean peninsula from northern China, while wet-rice cultivation was beginning to spread from southern and eastern China. Japan, meanwhile, remained home to the ancient hunter-gatherer Jomon culture. The past thousand years have seen the two farming traditions, the one based on millet, the other based on rice, continue to expand in East Asia. In particular wet-rice agriculture is spreading outwards from its core area in the Yangze Valley in all directions. From the southern China region will spring two major migrations down into South East Asia, one moving down from South West China, the other from the south China coast. The end point of these migrations will occur thousands of years hence, as far afield as Africa and Hawaii. In both northern and southern China, material culture is advancing, and both have seen the rise of powerful chiefdoms who can support the services of skilled craftsmen. Trade routes cover the entire East Asia region (except Japan), leading to cultural and technological exchanges between widely dispersed areas; and East Asia has also received influences from further west: pastoralists from the steppes of Central Asia arrive bringing with them skills in metallurgy. These various stimuli are leading to the emergence in China of one of the greatest civilizations in world history. To the north east, millet cultivation has spread across the Korean peninsula, whilst in Japan, the ancient Jomon hunter-gatherer culture continues to thrive. Over the past thousand years trade networks have grown to cover the area of present-day China. This results, amongst other developments, in the spread of metallurgy into the Yellow River and then the Yangtze Valleys. Bronze technology has come to East Asia, ultimately from the Middle East via a chain of small-scale exchanges across central Asia. These developments coincide with the emergence of urban civilization in both the Yellow River and Yangtze valleys. 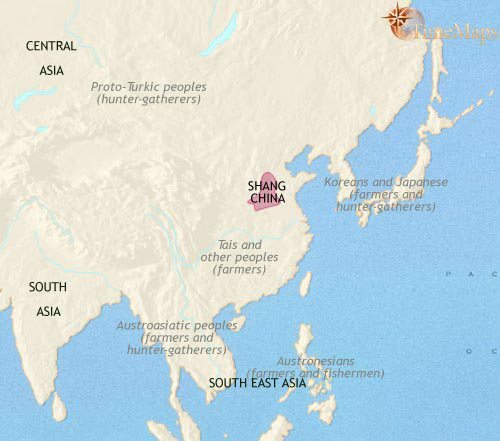 In particular, the rise of the Shang dynasty in northern China marks the beginnings of written history in ancient China. The pictographic script used is very similar to the modern-day Chinese writing system. Meanwhile, rice farming is spreading into South East Asia from southern China. Rice cultivation also appears in Korea. Japan, on the other hand, remains beyond the reach of agriculture, and the elaborate and ancient Jomon hunter-gatherer culture continues to thrive there. In southern Korea, wet-rice cultivation has established itself as the staple crop, though in the north millet and soybeans retained their dominance. Bronze technology reaches the Korean peninsula about now, from northern China. In Japan, the late Jomon people appear to be taking up farming as a minor part of their food culture, cultivating some local wild plants such as yams and taro, as well as rice. Hunting and gathering remain the major preoccupations, however. 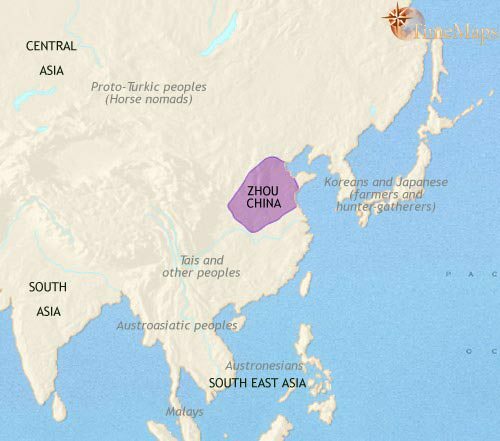 The past centuries have seen the Zhou kingdom of northern China fragment into a number of large, highly organized states. These are continually at war with one another. Despite this, civilization has made huge strides in all spheres. The use of iron has come in from western Asia, and iron farming tools have come into widespread use. This has greatly increasing food production, and commerce and industry have also expanded. This is leading to widespread social change, and into this fluctuating environment comes one of the most important philosophers in world history, Confucius. His teachings will be hugely influential on the life and thought of the peoples of East Asia from ancient times right up to the present day. Bronze age Korea is divided into numerous small but warlike chiefdoms, whose aristocracies have developed a fashion for large stone-built graves (dolmens), often furnished with bronze weapons, fine ceramics and jade objects as burial goods. Contacts between Korea and Japan are growing. At this time groups of Koreans are migrating to Japan, introducing their culture, based on rice cultivation, and their knowledge of bronze working, to the southern Japanese island of Kyushu. Civilization has continued to make remarkable advances within the Chinese world in recent centuries. A centuries-long phase of continuous warfare between large, well-organized states, known to Chinese history as the “Warring States” period, led to the emergence of one super-state covering the whole of ancient China. This took place in the reign of Qin Shi Huang, the “First Emperor” of China. This proved to be a false dawn. The brutal policies of the First Emperor’s regime soon brought about its downfall, and a brief period of chaos has been ended with the establishment of the Han dynasty in power. These developments within China have been matched by the union of nomadic tribes on the eastern steppes of central Asia under Hun leadership. This is the first of a series of warlike nomadic confederacies that will have a profound impact on east Asian history. The use of iron has spread to both Korea and Japan by this date. In Korea, powerful chiefdoms centred on small walled towns have appeared, while in Japan, the rice-growing culture brought from Korea in about 500 BC – which in Japan is called the Yayoi culture – is gradually spreading north and east. 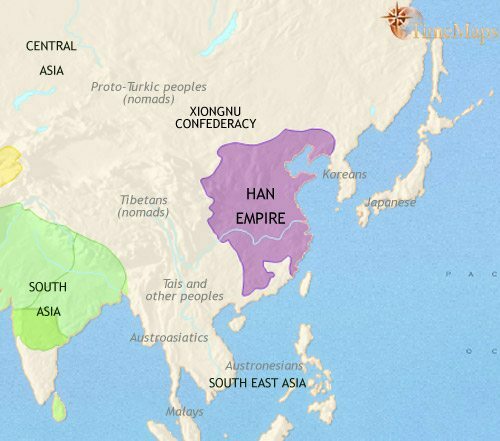 The Han dynasty has now ruled a united China for 200 years. The peace they have maintained has led to an upsurge in prosperity and in material civilization. The Han government has adopted Confucianism as its official ideology; it has also built on the centralised bureaucracy of the earlier states (above all Qin) to develop a huge and sophisticated administrative system. This includes methods of ensuring that government officials are appointed and promoted on merit – a practice that will not arise elsewhere in the world for another two thousand years (and even then as a result of China’s example). In these and many other ways the Han regime is laying the foundations for later developments, in China as well as other East Asian nations. 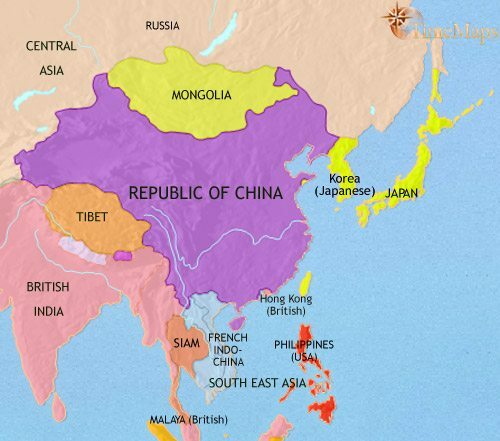 With China now unified and able to exert great power beyond its borders, central Asia in the west, Korea in the north and Vietnam in the south have been drawn deeply into its orbit, with a large portion of each becoming integral parts of the Chinese empire. Japan, also, has come to some extent under China’s influence. This country has seen the rise of powerful and warlike chiefdoms, some of whom pay tribute to the imperial Chinese court. Chinese power has also enabled a new trade route to the West to be opened up – the famous Silk Road across central Asia. Four centuries of unity for ancient China, under the Han dynasty, came to an end in AD 220, as government weakness and peasant revolts shattered the empire. China has since experienced a history of barbarian invasion and internal warfare. Buddhism has now become a major influence within China, reaching all members of society, from top to bottom. China’s cultural influence upon neighboring peoples has not waned. 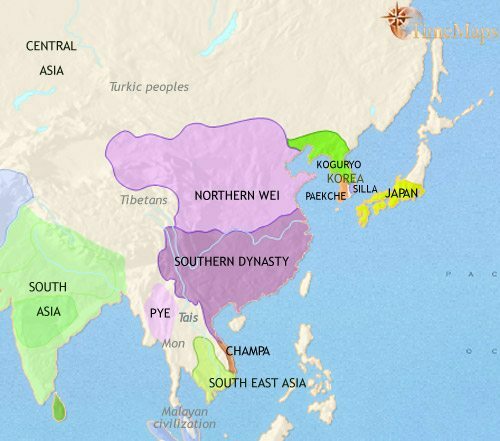 Kingdoms in Korea are modelled along Chinese lines, and their elites have adopted Chinese culture wholesale. Most importantly, both Confucianism and Buddhism have been imported into Korea from China, and have made great headway there. Japan continues to receive influences from Korea, with which it still has strong links. Wet rice cultivation and literacy (based on Chinese writing) have arrived here within the last couple of centuries. In China, centuries of disunity have given way to unity, under the Tang dynasty (618-907) – one of the greatest empires in world history. It is home to the wealthiest and most advanced civilization of the time. The Chinese have ever since regarded the Tang era as one of their most glorious in their history. It is no surprise that this period sees the high watermark of Chinese cultural influence upon neighboring countries. The Tang empire’s authority reaches deep into central Asia, and as a result this is one of the most flourishing periods for trade across central Asia along the Silk Road to the west. At this time the Tang borders touch those of the Islamic Caliphate, based in the Middle East. Across this border passes one of the key Chinese inventions, paper. This is apparently as a result of some Chinese paper-makers being taken captive after an armed clash with Muslim forces. The Japanese and Korean states have all consciously modelled themselves upon the Tang empire, and Confucianism and Buddhism, both Chinese imports, will endure as key elements within their societies right up to modern times. Much of East Asia belongs to an international diplomatic and exchange system, with states in Japan, Korea, Vietnam and other regions paying tribute to the imperial Chinese court in Changan. In China, the great Tang dynasty has given way to the Song, a dynasty which will not experience the same degree of military success as the Tang but which will preside over a great period of economic advance in Chinese history. Korea and Japan are both loosening their ties with China, politically and culturally. Their aristocracies now play a much more prominent role in their societies than has been the case in China, where the civil service has been the key power broker, since at least the time of the Han dynasty. In its recent history, China has experienced mixed fortunes over the past two centuries. The Song dynasty has shrunk drastically in terms of its geographical reach, now ruling only southern China; however, this period is probably the one in which Chinese civilization makes the most dramatic technological and economic advances in all its history. Both Korea and Japan experience political instability and civil war, and in both countries military dictatorships come to power. Chinese cultural and political models continue to make headway to the south, in Vietnam. However, in central Asia developments are taking place which will leave none of the lands of East Asia unaffected. This is the rise to power of the great Mongol leader, Genghis Khan. In the last two centuries have seen, the whole of East Asia has been affected by the rise and fall of the vast Mongol Empire. 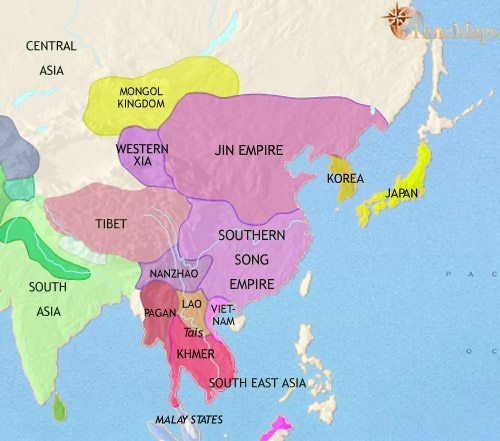 In the 13th century its armies conquered all China, Korea and Tibet, and mounted huge but unsuccessful invasions of Japan, Burma and even Java. The Mongols have also united much of central and western Asia under their rule. This period sees the Silk Road, that great trade route across central Asia, at its most active. As well as valuable trade goods, along it travel technological innovations such as printing and gunpowder – and disease: in the mid-14th century the Black Death spreads throughout Asia and Europe. From the later 14th century, however, the Mongols were pushed back to their homelands in central Asia. 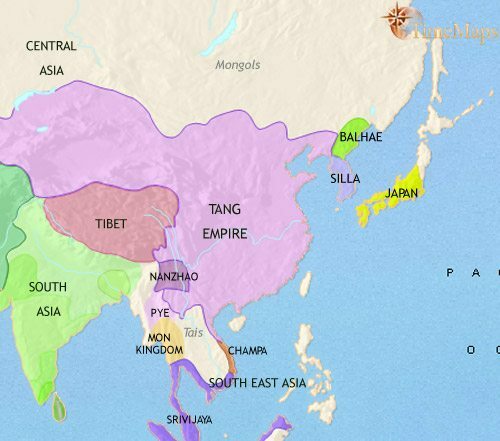 Native rulers, most famously the Ming dynasty of China, regained control in the countries of East Asia. The rulers in Korea, Vietnam and Burma all acknowledge the seniority of the Chinese emperor, and their countries are deeply influenced by Chinese political and cultural ways. Regular missions between these tributary countries and China stimulate much international trade. The Japanese stand aloof from this system, whilst in central Asia, the Mongols remain a real threat. In the coming centuries China will again fall victim to invasion from outside its borders, but not from the Mongols. 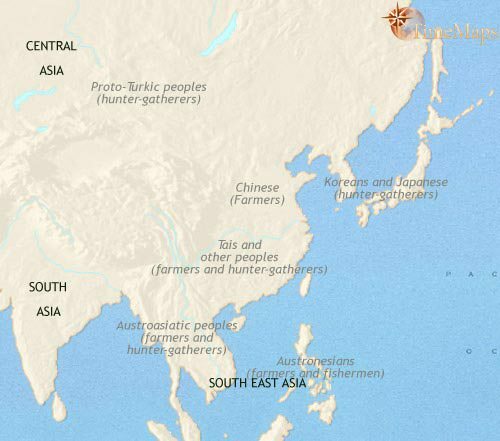 The past two centuries of its history have seen great changes taking place in East Asia. In China, the Ming dynasty has very recently been replaced by the Manchus. The Manchus, a people of central Asian origin who, having developed a Chinese-style state in Manchuria, took advantage of rising chaos in China to march on the capital and seize the throne. They are now in the difficult and long-drawn-out process of pacifying the entire country, under their regent, Dorgon. They call their dynasty the Qing. After more than 100 years of civil war, Japan was at last re-unified under a military dictatorship. This then embarked on two ferocious wars in Korea before being driven out by Chinese and Korean forces. These wars left Korea in ruins, and led that country to become a vassal state of the Chinese. Japan, meanwhile, has effectively isolated itself from the outside world to preserve its feudal society under its Tokugawa shoguns. This point in its history marks the high point of East Asian civilization before it feels the winds of change sweep through it from the West. 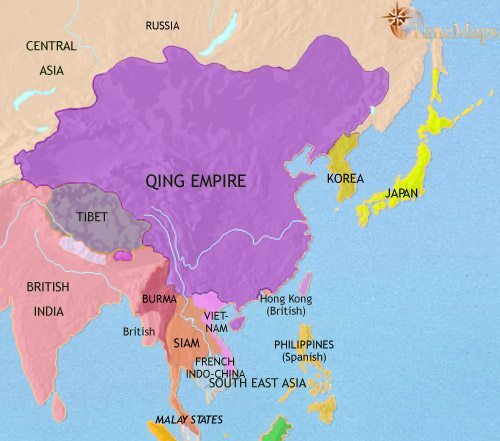 During the past century and a half, almost the whole of the region, and much of South East Asia, has either (like Tibet and Mongolia) come under the direct rule of the Qing emperors of China, or (like Korea, Vietnam and Burma) belongs to the Qing tributary system. In this, the rulers of the different states acknowledge the overlordship of the Qing emperors, whilst running their own affairs more or less unhindered. Korea, Vietnam, Burma and even states further afield all belong to this far flung system, in which international diplomacy and trade are carefully regulated. Japan has remained isolated from the outside world. Under the Tokugawa shoguns the old feudal order is carefully preserved, free from foreign interference. On the face of it, much in East Asia remains the same as it has been for a long time. 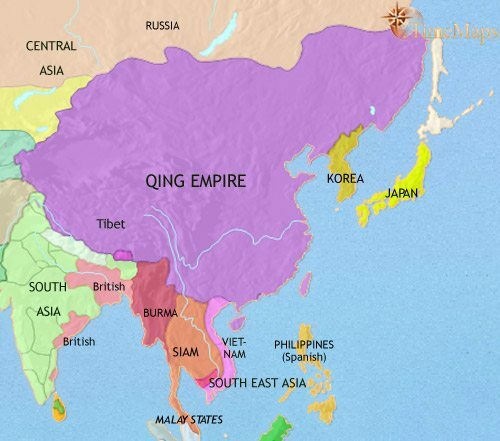 The Qing dynasty of China is still vigorous, its empire as vast as it has ever been, except for a small, remote notch taken out of it by a peace treaty with Russia. 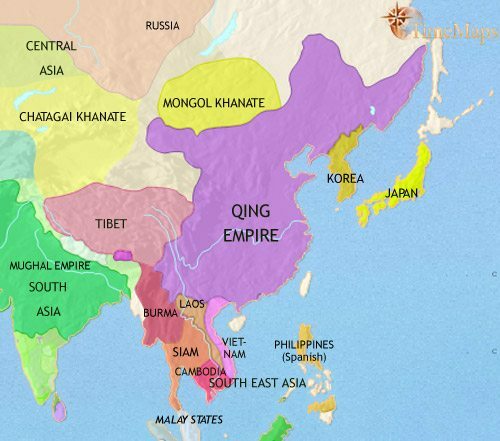 The Qing-dominated tributary system still covers most of the states of this vast region – Korea, Vietnam, Thailand, Burma. Japan remains the one notable exception, continuing the self-imposed aloofness it has maintianed through centuries of history. Westerners, however, are an increasingly troubling presence in the region. Their notion of international trade and diplomacy knows nothing of the carefully regulated relationships involved in the tribute system; for them, commercial and political relations between nations are conducted on equal terms. They are knocking more and more clamorously on the doors of East Asian countries to be let into their markets and mission fields. The ruling elites of these nations – conservative Confucians – all react with a mixture of disdain, bafflement and fury. They are determined to keep the Westerners out, especially as many of the European traders – particularly the British – are little better than drugs pushers trying to create a market for opium. In a radical depature from the age-long history of the region, recent decades have seen Westerners finally manage to push open the doors of the East Asian nations to trade and missionary activity. In China, the Opium Wars (1839-42 and 1858-60) led to several “unequal treaties” being imposed on China, entirely favorable to the Europeans. In 1853 Japanese isolation was suddenly ended by a show of force by an American naval squadron, and a similar set of treaties were imposed on Japan as on China. Korea has been the only country in East Asia to successfully isolate itself from the unfriendly forces swirling around it. What has happened in China and Japan could barely have been in greater contrast. While Japan has single-mindedly set about modernizing herself, China has struggled to deal with the Western challenge. Her attempts at modernization have been fitful and uncoordinated, and she has been handicapped by rebellion on a massive scale (notably the Taiping rebellion, 1850-65). This has gravely dislocated the enormous country, and allowed foreign nations to further impose their will on her government. As a result, the Qing dynasty has become more and more discredited in the eyes of its Chinese subjects. 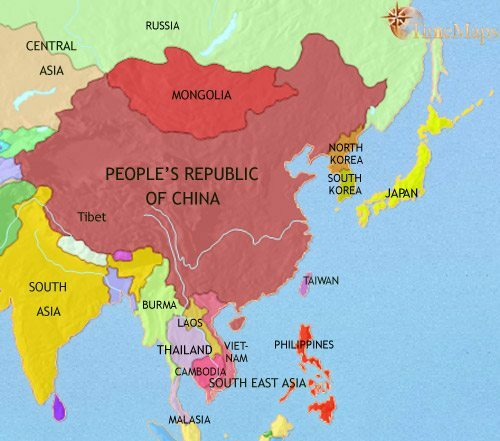 Over the last few troubled decades the old tributary system, which was centred on China and which for the last few centuries of its history had dominated almost all East Asia, has now well and truly vanished. The smaller countries have mostly fallen under Western control (Vietnam, Burma and Laos). 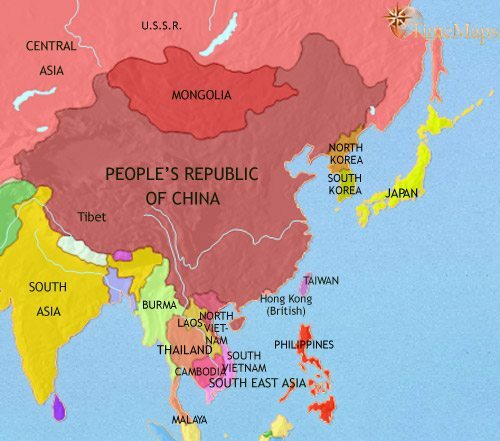 China herself has been unable to find an effective answer to the Western challenge, to the extent that the Qing dynasty, along with the entire age-old imperial system, has now gone, replaced by a republic. Japan has been the outstanding success story of the region, having created a modern, industrial nation on the foundations of a feudal society, in the space of one generation. This has enabled it to build a powerful military machine, which it has used to take its place alongside the Western powers seeking “spheres of influence” in China. It has in fact become the most aggressive of these powers, having conquered Korea and other territories, and defeated, first China, and then Russia, in war. In the past decades have been amongst the most intensively turbulent periods in all East Asia’s history. Much of the region has been torn apart by a succession of great wars. China was engulfed in civil warfare from 1916 onwards, first between the various warlords who had divided the country between them (1916-26) and then between Nationalists and Communists (1926-37). Then Japan, having secured control of Manchuria, launched a major invasion of China, which convulsed much of that country in more bitter fighting (1937-45). Between 1941 and 1945 Japan contrived to involve herself in a war for the Pacific with the USA and her Allies in World War 2; this only ended in her becoming the first country in the world to have an A-bomb dropped on her soil. In the post-war years, the civil war in China flared up again, ending in the Communist takeover of the whole country in 1949 (except Taiwan). Korea was torn apart by a terrible war between the Communists of the North, supported by China, and the people of the South, supported by America and her UN Allies (1950-52). Finally, since 1955 Vietnam has experienced almost continual war against her colonial masters, France. The later decades of the 20th century and the first years of the 21st century have been a much happier time for most East Asians than the preceding ones. With the exception of Vietnam, where American forces were heavily engaged against Communist guerillas until 1973, peace has been the normal condition in this vast region its during recent history. The peoples of Japan and South Korea, Taiwan and Hong Kong, have all become amongst the wealthiest in the world. The Chinese have also seen a massive rise in wealth since the late 1970s, with their nation becoming the second largest economy in the world. Even Vietnam has experienced a large measure of economic growth since the late 1970s. North Korea remains stuck in the 1950s, however: the country remains isolated and impoverished under what must surely be the most destructive regime in the world.